I sincerely hope that all is well with you, and that your sleep schedule is significantly more regular than mine at the moment. Since writing the last entry, I no longer have a sense of what is normal, a place to call home, or most everything I own, which I feel is what many people count as essentials to a stable life. But although I’m a bit of a wanderer for the next week, am living for three months out of two small bags, and am in Ireland all by myself, things couldn’t be better. I have the love of God, support of friends and family back home, life, and a will to actually live that life. Those are my essentials for stability. I left from Eau Claire on Tuesday and didn’t experience fresh air until I exited the Dublin airport the next day. Flying is surreal in that you don’t really notice how much you’re traveling until you get there and think to yourself, “Hey, I’m across the ocean! That’s kind of cool!” I was thankful that I got to leave from Eau Claire. My family was there to see me off, and during takeoff I got to see the entire city I was so used to from the sky. I could see Carson Park and my favorite route to run (which looked like no distance at all from the sky), the roof of my Oxford house, friends’ homes, and campus: all the places that are so familiar you almost forget how meaningful they are until you look at them from a new perspective. As I looked at my city and thought of everything that was going on in a place that looked so small, all I could think was God knows what He’s doing. And He knows what He’s doing here in Dublin, Ireland, a seamless patchwork of the old and new, the stark contrast of ancient history and modern life stitched together flawlessly. You have buildings that are hundreds or thousands of years old on the streets where people walk to work and school, chatting on their iPhones as they stroll past a row of houses built in the 1700s, and plays taking place in theaters older than America. I appreciate that about Dublin. Where I’m from, things that are historic or traditional are often dismissed as being culturally irrelevant; it’s all about the new and exciting things. 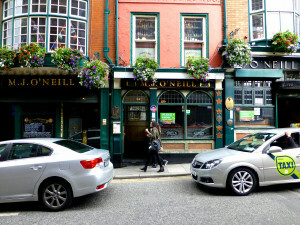 I find Dublin to be a living testimony that things that are old can still maintain an excitement, respect, and relevance that keeps them full of life. My two favorite examples of this were my visits to Trinity College and St. Patrick’s Cathedral. Trinity College is in the heart of Dublin, and is both a modern university and a place where some of the earliest Christian artifacts of Ireland are preserved in the Old Library. One of these is the Book of Kells, a copy of the gospels that was inscribed by monks around 800 a.d. They have two books open at a time, and the librarian turns one page every day, so if you ever go to see this breathtaking work, you’ll most likely see different pages than I did. Mine were Luke 3: 16-26 and the beginning of John’s gospel, with a beautiful icon of St. John and verse 1:1. I think that verse gives me chills every time I read it, so the fact that I got to see it was unbelievable. The rest of the library was filled floor to ceiling with old books, which filled the air with that friendly smell of wise words in old volumes. An old library filled with books and early Christian history…it’s a wonder they ever got me to leave. Likewise, St. Patrick’s cathedral was built in the early 13th century (though the parish itself is older), and is still a thriving church community. 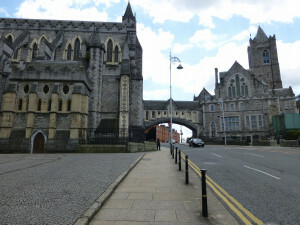 Outside of it is St. Patrick’s park, where the patron saint of Ireland baptized thousands of Irish people. Inside the majestic walls is the resting place of Jonathan Swift, an original copy of Handel’s Messiah (its debut performance was in this cathedral), and the current church choir who was having choir practice. Like I said, historic and alive. This morning I am leaving Dublin for a few days to travel in the countryside. I am thankful that God’s protection, that He is the Ruler of all and that he’s given me the courage to take this journey. Thanks for the update Rae. So excited for you and glad all is going well. Thank you, Far Mor! 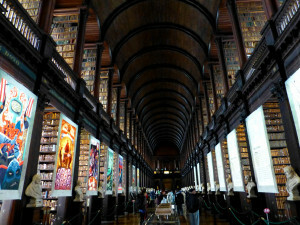 If you go back to Ireland, I would definitely make the trip to see the Book of Kells. Thank you so much for your prayers! What an adventure! Cool! I’m quite happy for you and was bragging to one of my co-workers about your trip– he’s a proud Scotsman (indicated by his license plate SCOTAM). And, I must echo previous comments from your earlier post: you write very nicely, engagingly, and smoothly. Just beautifully! God bless you! Thank you very much! I would be interested to talk with that gentleman when I have experienced Scotland! 2) Hearing the choir practicing in the historic cathedral. Wow! Historic and alive indeed. Both amazing experiences, and ones that I am thankful to carry with me now. And I too, thank you for the verbal visit to Dublin town. You saw the Book of Kells! Majestic! You saw centuries of history, and those pages will now live with you as your path of life continues. And you experienced St. Patrick’s Cathedral and heard the choir echo down through the majestic arches. Aye dear Rae, an indelible day . I can’t wait for the notes from the countryside. Majestic indeed! I lament the fact that we don’t have that kind of history in America, but it makes visits to Europe all the more special. Methinks a wondrous writer lurks within yee. Grandpa Juan. We are really enjoying your blog. You are a gifted author! Thank you, Amber! I’m glad that you guys are enjoying it, and that all is well with you in Pella.